SANTA ROSA, Calif. (January 17, 2019) – Calling 2018 the “new normal” for farming winegrapes in Sonoma County during which the region sought to recover from the previous year’s devasting fires, Karissa Kruse, president of the Sonoma County Winegrowers, addressed the Sonoma County Winegrape Growers today at the 28th annual Dollars & $ense Seminar and Trade Show. Kruse complimented the growers not only for their leadership in sustainability but for their commitment to the long-term preservation of agriculture in the region. Kruse has long used the Dollars & $ense annual meeting to make significant industry announcements. In 2014, she took to the stage to announce that Sonoma County Winegrowers would become the first 100% sustainable winegrowing region in 2019. As that quest closes in on its goal, Kruse continued to make news Thursday with some major revelations. Augmented reality is exploding in popularity throughout the country especially among the coveted millennial demographic. Using a smart phone, consumers download an augmented reality app. From there, they simply place their phone over an augmented reality wine label, and the label comes to life immediately, engaging the consumer with stories, video and information on Sonoma County’s quest to become the first 100% sustainable wine region. 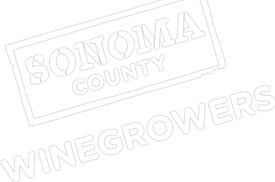 This ground-breaking marketing effort will be further supported with the establishment of a recording studio at the Sonoma County Winegrowers new office on Guerneville Road. The studio will enable the group to produce a bi-weekly show on farming, wine and the Sonoma County region in addition to conducting interviews with visiting sommeliers, media and industry experts. The studio can also be used to film quick updates on harvest as well as news and happenings around the county. With 2019 just starting, Kruse shared the latest numbers of the group’s five-year effort to become certified sustainable. The newest figures show that more than 97% of Sonoma County’s nearly 60,000 vineyard acres are participating in the sustainability program. Even better news, more than 89% of those acres have completed or are in the process of completing a third-party audit to obtain sustainable certification. With the goal well within reach, Sonoma County Winegrowers will continue to work with grape growers to assess their farming, business and management practices against more than 140 best management practices touching on water use, habitat protection, employee safety, employee training, community support and more. Sonoma County Winegrowers work with four programs (California Sustainable Winegrowing Alliance, Fish Friendly Farming, Lodi Rules and Sustainability in Practice) and all programs take a triple-bottom line approach. Each of the four programs have a third-party certification process and are comprised of best practices focused on becoming environmental stewards, economically viable and socially equitable. “I am so proud of the commitment made by Sonoma County winegrowers to become the first 100% sustainable winegrowing region. Everyone benefits from their efforts as it not only helps enhance the environment, but it is critical to maintaining the rural lifestyle and natural beauty that helps make Sonoma County a world-renowned area,” said Kruse.